Start or finish your holiday shopping right here on campus. Below is just a sampling of stores both on campus and beyond that offer a range of items from everyday essentials to one-of-a-kind items. For your convenience the stores are grouped by categories. For those who would rather shop online, the stores’ web sites, if available, are listed. Also featured are other ideas and venues for holiday shopping including the School of Social Policy & Practice’s auction, Penn Presents gift certificates, ICA gift ideas, and stores participating in the first ever ‘Buy Local Philly’ campaign. Modern Eye is a hip eyeglass boutique that specializes in hard-to-find designer eyeglass frames. Their selection of frames has something for every individual’s style—with a wide array of colors, shapes and sizes from brands such as DKNY, Calvin Klein, and Gucci. There is also an optometrist on site. Purchase more than one frame and receive a discount. Visit Modern Eye online at www.modern-eye.com. After over 70 years on campus, University Jewelers continues to offer quality jewelry and watches at affordable prices. With discounts on everything throughout the store, you can find gifts starting at $20. They carry both sterling silver and 14kt gold, and also have watches from famous names such as SEIKO and Tissot at discount prices. With the holidays drawing near, University Jewelers will be open on Saturdays in December. They offer free gift-wrapping. American Apparel is the newest arrival to the University City shopping scene. Featuring no-frills sports and leisure wear, this season the store is introducing Sustainable Edition, a line of clothing exclusively made using organic cotton. Heralding its L.A. based Vertically Integrated Manufacturing, American Apparel is offering a store exclusive Velour Jogger in camel and cappuccino tones for $46 along with its famous triple knit track jackets for $48. For more information visit www.americanapparelstore.com. Ann Taylor Loft is a great clothing store where you can find the perfect gift. They have a variety of beautiful sweaters, cute scarves, hats, gloves, and lovely accessories. For shoppers on a budget, take advantage of Ann Taylor Loft’s sale items with discounts ranging from 30-50% off. Current fall items are on sale including 25% off hats, gloves, and scarves. Shop online for holiday gift ideas at www.anntaylorloft.com. There’s even a holiday event calendar online to help you “plan the perfect winter looks” for going out to dinner or attending your office holiday party. The Gap is featuring a special holiday sale. For every $75 you spend, you will receive a $15 shopping card, redeemable between December 18 and January 31. The store is featuring corduroy jackets in all colors ($49.99). With a large variety of hats, scarves, winter vests, and jackets, the Gap has everything you need to keep warm this winter. They are featuring holiday packages of flannel pajamas, complete with a bow, as well as holiday socks (3 for $15). Assortments of candles and perfume by GapScent are perfect stocking stuffers. Find even more items and discounts online at www.gap.com. Urban Outfitters kicks in the holiday season with a special X-mas tree sale. Three-foot tinsel trees are $19, while one-foot trees are only $12. Boxes of off-color holiday cards are also on sale and range from $10-$15. A wide variety of colorful tree lights and comic ornaments are complemented by the popular Grow-A-Santa Claus and Grow-A-Dreidel figurines, available for $4. The Ion portable turnable, one of the hottest items of the holiday season, is also available for $100. Not sure what to buy? Get gift ideas from Urban Outfitters’ online gift center at www.urbanoutfitters.com. Avril 50 is a wonderful source for international newspapers and magazines, as well as unique stationary. The international flair sets it apart from other stores, and the variety will please everyone from sophisticated readers to the gossip enthusiast. The store features international teas, coffees, chocolates, and cigars. The unique holiday cards and 2006 calendars will add a cultural taste to your holiday season. The Marvelous! features a collection of musical genres with extensive jazz, soul, pop and rock sections in all types of formats from new and used CDs and cassettes, to vintage records and even 45s. A magazine and comic book section completes this store’s old-school feel and top-notch service. Rare or international albums may be special-ordered upon request. Come find the Philly/London R&B sounds of Floetry with their newest album Flo’ology for only $14.98. 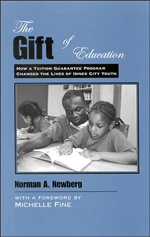 The Penn Bookstore sells books by Penn alumni, faculty and staff including The Gift of Education: How a Tuition Guarantee Program Saved the Lives of Inner City Youth by GSE Senior Fellow Norman Newberg. He will be there reading from his book on December 12 at 4 p.m. The Penn Bookstore is offering great deals especially during the annual Salebration, December 15-16. With such a wide variety of products, there’s no way you can leave without something interesting for all your loved ones. The Bookstore has books on any subject you can think of—from science to poker. There is also a selection of books with holiday themes such as The Simpsons Holiday Humdinger ($14.95) and Santa Lives! Five Conclusive Arguments for the Existence of Santa Claus ($12)—all for 20% off the list prices. Many books from the New Arrivals list are also 20% off the cover prices and, with a Barnes and Nobles membership card, you can get an extra 10% off. For the sports lover on your list, the Penn Bookstore has a great selection of sports books including books by Lance Armstrong, Michael Jordan, Dan Marino, and Phil Mickelson ($14-$45). They also have do-it-yourself books and kits such as The Merry Christmas Tree Kit ($7.95), Build Your Own Snow Globe ($8.95), and Fireplace in a Box ($8.95). If books aren’t your idea of a great gift, the Penn Bookstore has a selection of many other items that may interest you. With board games in many themes, such as Disney Chess ($34.95), Family Guy Dominoes ($14.95), Mickey Mouse Monopoly ($34.95), Philadelphia Eagles Monopoly ($34.95), Scrabble on a keychain ($4.95), and Mad Libs on a keychain ($9.95), you’re bound to find something for everyone. And, of course, who doesn’t love music and movies? Their music section contains selections from practically every artist and genre. There is even an international section and plenty of holiday music, on sale for $4.99 and $6.99. The section also includes DVDs, including newly released movies, many at discount prices. There are holiday movies on sale from $9.99 to $26.99. The Penn Bookstore also sells Godiva Chocolates. Choose from beautifully decorated boxes of different types of chocolate ($7- $25), Café Godiva ($18.50), or the Godiva teddy bear that comes with a box of chocolates in its paw. You can also get your holiday essentials at the Bookstore—wrapping paper, along with gift bags, CD gift envelopes and ribbons, and Christmas and Hanukkah boxed card sets ($9-$18.95) are 20% off. For hours and general information see www.upenn.edu/bookstore/. Penn faculty, staff, students, and UPHS employees are entitled to buy educationally discounted products from the Computer Connection. Choose a computer for your personal productivity or home entertainment. Holiday offers for faculty and staff include the Apple iMac G5 for $1,199, the new ThinkPad Z60M with a 15.4 inch widescreen for $1,450, and many other selections of desktop and laptop computers. Not sure what tech items you want? Check out the Computer Connection’s WishBook 2005. This 24-page WishBook is fill of the latest computers for home entertainment, gadgets, games, and gifts! It is available at www.business-services.upenn.edu/computerstore/ and can be downloaded as an Adobe PDF. They have also set up a special “Holiday Hotline” for individuals who wish to take advantage of the savings (215) 573-2850 and in doing so the department order line (215) 898-0889 will stay more clear of traffic. With close to 100 places to eat why not offer a gift certificate to any of University City’s diverse selection of dining venues. From romantic cafes to inexpensive eateries, there is something to satisfy all taste buds and budgets. University City also offers a great representation of ethnic cuisine such as Ethiopian, French, and Greek. As a promotion to highlight its diverse dining, University City will again hold Dining Days, January 12-19, where you can get three courses for either $20, $25 or $30. For more information see www.ucityphila.org. The Black Cat Gift Shop offers a unique assortment of candles, beauty products, jewelry, clothing, and fun knick-knacks. The store features products by local and worldwide artisans, with an emphasis on social significance. While browsing through the store you will encounter flowers made from recycled cans and environmentally friendly bath products. There is a large array of handmade ornaments, international crafts, hand-knit scarves and hats, unique frames, and colorful sun-catchers. From earrings made of ruler-pieces to gift bags made of newspaper, you will surely find a one-of-a-kind gift at The Black Cat. Free gift-wrapping is available. Shop online at www.blackcatshop.com. Messages Card Shop is more than just cards. They carry everything from handbags to holiday decorations. For this holiday season, you can find Christmas and Hanukkah items for sale. Purchase Christmas ceramics, such as plates with holiday inscriptions and snowmen that light up from $14.99 and up. Also, for a limited time, Vera Bradley bags are on sale for 25% off original prices. You can also pick up your holiday essentials such as wrapping paper and Christmas cards. The Museum Shop at the Penn Museum offers a huge collection of original and replica articles from around the world for you to take home to your loved ones. From hand-sewn Guatemalan flower purses ($12.50) to replica bangle bracelets from the Royal Tombs of Ur exhibit ($64), the Museum Shop has something for everyone. To keep in tune with the holiday spirit, you can even buy animal Christmas tree ornaments from Kenya for only $8.25. There is also the Pyramid Shop for kids which sells unique items such as a Hieroglyphics Decoder Set ($10) and Old Mummy Card Game ($15.95). Some items can be purchased online at www.museum.upenn.edu/new/shop/index.shtml. Roses Florist is a University City mainstay, celebrating its 24th Christmas at Penn. Give the gift of beautiful flowers and plants or treat yourself—choosing from tropicals, European/dish gardens, silk arrangements and much more. Add color and fragrance to your home with holiday themed arrangements. For something different, try the Cactus Garden for $45. Roses Florist also features adorable stuffed animals for $10 and up, and great candle gift sets for $20 and up. Try their gourmet food and fruit baskets for a deliciously memorable gift. Items can also be ordered online at www.uofprosesflorist.com. Shop@Penn is an online portal for purchasing Penn products emblazoned with the Penn logo. You’ll find accessories, clothing, teddy bears, mugs, note cards and other items including products designed according to school, graduating class or a favorite Penn team. Shop online at www.shopatpenn.com. Douglas Cosmetics has all your cosmetic needs and more. With gift sets of cologne and perfume from famous names such as Armani, Ralph Lauren, Bvlgari, and DKNY, starting at $60, you’ll find gifts for everyone on your gift list. And if you’re feeling exceptionally creative, you can make your own gift basket. You can find little stocking stuffers at Douglas Cosmetics as well. Items such as, Santa Shower Puffs are on sale for $2.95. And exclusively for the holiday season, make a purchase of $35 or more and get a free vanilla scented Douglas Candle. Trophy Bikes has not only bicycles, but also messenger bags, cozy apparel, and many fun bike accessories. This is a bike store that sells everything the other shops forgot about—from hi-tech racing and touring merchandise to everyday biker goods. This is a biker’s paradise selling Jamis, Fuji, Waterford, Gunnar, Independent Fabrications, Moulton, and Breezer to name a few. It has everything needed for your bike, even bike mechanics that provide quick service and free estimates. Trophy Bikes also has bikes available for rent for $25/day which also includes a bike lock, helmet and a map. For more information visit http://trophybikes.com.